It was five and the heat was quickly dying; the glorious golden colouring of the late afternoon was creeping over everything when she rose from her chair. She moved to the door and took from behind it two large white calico bags hanging there, and from nails in the wall she took down two large brown cotton kappies. She walked round the table and laid her hand gently on her daughter-in-law’s arm. The younger woman raised her head slowly and looked up into her mother-in-law’s face and then suddenly she knew her mother-in-law was an old, old woman. “I am going out to sow – the ground will be getting too dry tomorrow,” she said gently. The younger woman looked into her face and taking one of the brown kappies from her hand, put it on, and hung one of the bags over her left arm. The old woman did the same and together they passed out of the door. The mould in the land was black and soft: it lay in long ridges, but the last night’s rain had softened it and made it moist and ready for putting in the seed. The bags which the women carried in their arms were full of the seed of pumpkins and mealies. They began to walk up the land. At every few paces they stopped and bent down to press into the earth, now one and then the other kind of seed from their bags. Slowly they walked up and down until they reached the top of the land, and then they turned and walked down, sowing as they went The light of the setting sun cast long, gaunt shadows from their figures across the ploughed land, shadows that grew longer and longer as they passed slowly on pressing in the seeds. The seeds! … that were to lie in the dark, dark earth and rot there, seemingly to die, till their outer covering had split and fallen from them…. And then when the rains had fallen, and the sun had shone, to come up above the earth again, and high in the clear air to lift their feathery plumes and hang out their pointed leaves and silken tassels! To cover the ground with a mantle of green and gold through which sunlight quivered, over which the insects hung by thousands, carrying yellow pollen on their legs and wings and making the air alive with their hum and stir, while grain and fruit ripened surely… for the next season’s harvest. …… Near one of the camps are the graves of two women. The older one died first from hunger and want. The younger woman tended her with ceaseless care and devotion till the end. They buried them side by side. There is no stone and no name upon either grave to say who lies there … our unknown… our unnamed… our forgotten dead. If you look for the little farmhouse among the ridges you will not find it there today. A syndicate of people from Johannesburg and London bought the farm, they purchased it from the English government, because they think to find gold on it. They have purchased it and paid for it … but they do not possess it. Only the men and women who lie in their quiet graves upon the hillside, who lived on it, and loved it, possess it… and the piles of stones above them, from among the long-waving grasses, keep watch over the land. - Entitled “Eighteen Ninety-Nine”, from “Stories, Dreams and Allegories” by Olive Schreiner, 1906, from the book “A Century of South African Short Stories”, published by Ad Donker, 1978. This Schreiner story recalls the hardships endured by the women left behind after their male relatives had succumbed during the Anglo-Boer war in South Africa, 1899 – 1903. The Afrikaans word vryheid means freedom, liberty – even independence. Many South African farms and towns have Afrikaans names, and only someone who knows this evocative language can appreciate the passion behind these names. The country’s turbulent history is the fount of many. Other names express the emotions of a certain time and place – longing, happiness, sometimes melancholy. In no other Western country are names used so descriptively to reveal the heart of a people and their attachment to the land. And so it is with Vryheid, in the province of KwaZulu/Natal. Through this part of South Africa flows Blood River, the 1838 milestone in Zulu/Afrikaner history. Vryheid was the capital of Die Nuwe Republiek, the territory given to Voortrekker leader General Lucas Meyer by Zulu chief Dinizulu in return for help in his struggle against the two opponents of his father, Zulu king Cetshwayo. This land was 1 355 000 morgen in size. The republic lasted only three years, from 1887 to 1890, but this land grant is an historical fact. Farmers in the area should carefully examine the land claims against their farms for historical authenticity. For years now, Vryheid farmer Kerneels Greyling has been involved in running battles with authorities past and present about his family’s four farms he now says are “worthless”. Copious correspondence handed to our researchers reveals a desperate farmer trying to save his life’s work. These farms are either near or bordering properties handed over to ‘emerging’ farmers by the Department of Land Affairs (DLA). Stock and crop theft are the order of the day. “They come seven kilometers to steal. They hire a bakkie (pickup vehicle) to collect the meat and the mealies (corn)”, says Greyling. He had to go 38 times last year to his daughter’s farm to spend the night trying to catch crop thieves there. He blames the previous government for his current predicament, and his barrage of letters to the former state president has elicited no assistance, no sympathy. Mr. F.W. de Klerk has essentially washed his hands of the present situation. More ominously, no commiseration has been forthcoming from Deputy Minister of Land Affairs Dirk du Toit – on the contrary, the aging Mr. Greyling was given short shrift by du Toit who told the farmer his efforts at redress bordered on the vexatious (selfsugtig). Greyling’s predicament reveals nothing else other than that South Africa’s commercial farmers are on their own. Greyling sits with an “emerging farmer” (this is surely a euphemism!) right next to his property. Mr. Johannes Mdlalose, brother of the infamous Jabulani Mdlalose (whose sole occupation appears to be the selling of plots on white farms to itinerants at R1 500 a throw), wants to bring his 400-strong community onto his newly-acquired farm. Johannes has already demanded a five meter public thoroughfare through Greyling’s mealie fields. Greyling says he told the government there was little water on Johannes’s new farm – that the borehole had almost dried up. The soil is poor and there is much erosion. Only 18 ha is under irrigation. All the dams are empty, and the farm is only good for a limited amount of cattle. So why hasn’t Johannes invited his community to occupy the farm? Greyling’s activism and continual complaining appear to have stemmed an invasion of squatters on to Johannes’s farm, at least in the short term. Two years ago, Greyling’s attorney wrote to the DLA and demanded sight of a development plan for Johannes’s farm. In March 2002, the DLA informed Greyling that the steering committee formed to look at the planning for Johannes’s farm would take into consideration “the views and concerns of the neighbouring farming community, including yourself”. Further, the planning would address “the sustainable settlement pattern and the building up of the desired relationship between the Mdlalose community and its neighbours”. In March 2003, the Department of Land Affairs told him that “detailed planning has not been done”, but will be forthcoming when DLA transfers planning funds to the Zululand District Municipality. Greyling says he will not be satisfied unless cognizance is taken of what is needed to sustain residents on Johannes’s farm. He refers to Act. No. 70 of 1970 which sets limits on the size of land subdivisions. Although this Act has been repealed, there are some clauses remaining. The Vryheid farmer declares an acceptable sustainability formula is at least 3,5 ha per beast or 300 ha per family. He says he has no objection to black farmers next to him, as long as they can make a living and not have to steal to keep alive. One needs R3 600 to travel to Vryheid for one year, 6 days a week, says Greyling. So if the farm is non-sustainable, from where will family members obtain money to travel to town for a job and shopping? In 2001, farmer and former Democratic Alliance member of Parliament Wessel Nel wrote that “land is a shaky vehicle for redistribution”. He says the government is wrong to believe that small cash grants make for the beginnings of sustainable small-scale farming. Establishment capital of around R25 000 has the purchase capacity of approximately 10 hectares, a meager R10 000 having been set aside for a house, livestock and operating capital. This would only sustain perhaps 2 head of cattle and 5 goats or sheep. The gross income from such animals would be around R2 500 per annum, with maybe 2 litres of milk per day, says Nel. These facts would assume no deaths or theft, 75% reproduction, no domestic slaughter and no expenses. Nel makes the same argument as Greyling – if a small holding were only 20 km from town, and if only two family members commuted daily by taxi to work or school, the taxi fare alone for the year would far exceed the total gross annual income of the smallholding. Such a land redistribution programme would condemn the beneficiaries to a “rural poverty trap”, declares Nel. Hence Greyling’s reasons for demanding a development plan for the neighbouring 5 000 ha farm. Some years ago, seven black farmers and their families were given 200 ha by a church mission group, right next to Greyling’s farm. (The church people have long since abandoned their converts. Giving them the land was enough, they possibly thought.) For years now, on a daily basis, Greyling experiences border fencing theft, with the squatters’ herds mingling with his. These neighbours walk through the farm, leaving the cattle gates open. Some new settlers, land claim transfer, Vryheid. Greyling loses R30 000 a year in mealie theft, and fires move on to his farm with regularity. He often hires a helicopter at R1 350 an hour to search for his stolen stock. In one three-month period he lost 85 head of cattle. He and his son, with their security company personnel, regularly go into traditional areas to try and retrieve their cattle. They often see the skins and the heads where the cattle have been slaughtered. They recognize their own animals. This “citizen policing” is obligatory because the police are simply overwhelmed and, in many cases, are clearly not interested. Greyling and his sons have to pay informers – sometimes up to R9 000 a month – to find their cattle. The rate is so high because informers are in many cases beaten by the thieves. So Greyling and his sons pay the security company, the helicopter costs, the informers, the commandos and the people who patrol their lands. We drove through Greyling’s 1754 ha farm. He produces mealies, wheat, beef cattle and sheep. 400 ha are irrigated. He has built roads and bridges throughout the property. He pointed out a derelict neighbouring property where squatters had moved in. To stop them stealing from him, Greyling planted mealies for them right on their doorstep. For six years he did this, then they complained the weed killer Greyling supplied was “no good”. The stealing re-commenced. Despite Greyling’s activism in trying to stop an influx of squatters on to his neighbour’s farm, he currently cannot sell his own farms. The government’s land reform program has seen to that. The borders of KwaZulu are moving onto what used to be productive commercial farmland. Other farmers in the area have been driven off their properties. A pattern is developing throughout traditional South Africa. Tribal chiefs appear to be having a field day courtesy of the land reform program. In northern KwaZulu/Natal, in Mpumalanga, in the Eastern Cape, in Limpopo, the chiefs are working assiduously to gain land, not for “the people”, but for themselves. Vryheid is no different. One Jabulani Mdlalose has become something of a warlord in the area. He has encouraged the invasion of privately-owned farmland by selling plots to squatters. As in the north of the province, Mdlalose is emboldened by the lack of law enforcement. Early in 2003, he notified the provincial Department of Land Affairs in writing that the Othaka Tribal Authority intended to take possession of 200 commercial farms in the area. A deserted school house, Gwebo land claim, Vryheid. Although no such land claim has been validated, he has nonetheless threatened certain farmers to vacate their properties. To back up these threats, he has sold plots on their farms, and the illegal invasions have taken off. When Jabulani’s father Chief Dalwayini Mdlalose died in 1994, Jabulani’s younger brother Johannes was appointed his successor. Because of Jabulani’s activities, Johannes Mdlalose and 18 Vryheid farmers approached the Pietermaritzburg High Court to grant a permanent restraining order to prevent Jabulani from persuading people to invade, trespass, graze livestock, plant crops or build homes on privately-owned farms in the district. (1) A temporary restraining interdict was granted against him. And not a moment too soon! In September 2002, three local farmers appealed to the government to prevent the illegal occupation of their farms. Since 1986, Johan Birkenstock has produced an average of 30 tons of maize per month on his farm Forlorn Hope. After the new government came to power, things worsened. His fencing was stripped, and his cattle and crops were stolen. The hunting of his game and cattle increased to such an extent that calves were regularly ripped apart by the dogs. His grazing was regularly burnt. Then his life was threatened, and he stopped milling. In the same vein, farmer Dirk Kotze told MP Slabbert of his woes. He has been farming on Palmietfontein for thirty years. His farming operation supported more than 1 000 families with food per month, and 100 families with milk per day. Farms bordering on his were occupied by illegal squatters and the security situation deteriorated dramatically, he said. His family regularly received threats, and on 6 February 2003, he and his wife were brutally attacked by five armed black men and robbed of their firearms, money and vehicle. (2) As with many other farmers, Kotze feels helpless. With no law enforcement, he sees no future in farming and asks the government to buy his farm. His farm is in pristine condition – Eskom lines, sufficient water, good buildings and chicken runs. A third farmer in the area, Steve van Jaarsveld was visited by Jabulani in July 1999. He told Steve of his plans to “settle” people on various commercial farms in the district. In March 2002, occupations began on the neighbouring farm Wanbestuur which belonged to absent farmer Neil Prinsloo. 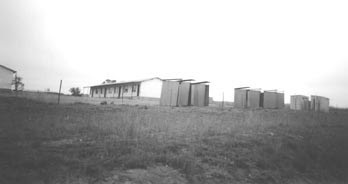 The farm had been returned to LandbouKrediet (an agricultural loan company) because of Prinsloo’s financial difficulties. The squatters appeared in April 2002 and erected structures. Van Jaarsveld reported the matter to the police who said they could do nothing because the owner of the property, LandbouKrediet, had not laid a charge. Despite many calls to LandbouKrediet , it appears no charges have been since laid, and more squatters have streamed on to the farm. In June 2002, structures appeared on the farm Metzelfontein which van Jaarsveld was renting. The police investigated, but again said they could do nothing because “the people said they had purchased the farm from Jabulani Mdlalose”. End of story! No investigation into whether what they said was true, no removals, no charges laid. It would appear that the police and Mdlalose are very good friends, as is the case with Chief Mathaba and the police in northern Natal. (See the story of the Dunn family). We saw the farms of Dirk Kotze, Johan Birkenstock and Fanie van Jaarsveld. In van Jaarsveld’s living room, he showed us bullet holes in his leg – he had been recently attacked and beaten outside his front door. If it were not for his boerbul dog, he would have been killed. As it was the three men who assaulted him shot the dog who miraculously survived. The bullet holes through the brave animal’s head can be clearly seen, and he is none the worse for wear! Steve van Jaarsveld told us he had lost many head of cattle. “Every year they burn you out”, he declared. Johan Birkenstock confirmed he had to put out fires 33 times over one winter. “We can’t move the squatters. The police can’t do it, and it takes too much money and heartache. Dirk Kotze’s farm was also burnt out. The fences were simply taken away. They stole all his cattle. They steal each month, and every year they burn him out. How can we farm under these circumstances? Where in the world do you find such a situation?” Van Jaarsveld told us other farms were being invaded: Mr. Bonnie Hills’ Mooifontein, Brakspruit belonging to Mr. Koos Scheepers, and Mr. Heinrich Hegeler’s farm Nellie’s Rust. Thus starts the endless cycle of litigation as orders served on certain squatters are rendered invalid because they have left and are replaced by other squatters. In one case, and eviction was granted and the squatter refused to move. He was then evicted (more costs!) but simply moved back into his house and has increased his building activity. In January 2003, Vryheid attorney Bertus van der Merwe wrote to the Senior Prosecutor at the Magistrate’s Court in Vryheid that “a very dangerous situation is developing” along the Vryheid-Babanango road where properties are being invaded by “people who seem to have the impression that the authorities will not step in to take the necessary steps to protect the rights of owners”. The Department of Land Affairs wrote to attorneys representing the affected farmers on 27 March 2003, declaring that they do not support land invasions and that “the landowners should act as soon as possible. They should lay trespass charges with the police in order to avoid legal costs”. Farmers know that, but the lack of activity by the police forces them to institute privately-funded civil actions. The police say they can do nothing about land that is “under dispute”. But all they have to do is check with the local municipality to find out who owns what land. This is a lame excuse, and the SA Police’s lack of action is probably the main cause of this terrible rash of land invasions occurring throughout South Africa. In June 2003, Jabulani Mdlalose was arrested and charged with illegally selling plots on commercial farms. He was granted bail in mid August 2003. Further fraud charges are building up against him. The court has also restrained him from purporting to be chief of the Othaka Tribe and allocating land on private farms. This restraint order came only after civil action was taken by local farmers, one of whom was Jaco Duminy, chairman of the Vryheid Farmers’ Association. He showed us copious correspondence addressed to the Minister of Safety and Security, the local member of Parliament, the KwaZulu/Natal premier, the Department of Land Affairs and the letter that started it all, from Jabulani Mdlalose to the Department of Land Affairs (DLA) dated February 2003 where he declares he is head of the Othaka Tribal Authority. This letter “informs” the DLA that land which was given to him “by the former government in 1986/7” will now be used “for farming from 1 April 2003”. (Of course Jabulani’s version of “farming” is somewhat different from that of commercial farmers in the area). He then attached a list of the commercial farms which he says were given to him – there were nineteen in all. The wires on Jaco Duminy’s farm gate had been cut as we drew up to his farm. Some of his cattle were already drifting on to the road. Duminy told us he had also been visited by a delegation from Jabulani who stated they would take his farm. The restraining order on Jabulani has, however, put a damper on the visiting delegations, but it is a Pyrrhic victory because it cost the farmers more than R80 000 to get that restraining order, and the fraud case against Jabulani is not yet completed. Once again, complaints about the police abound. A local farmer noticed his fencing wire was cut. Members of the police’s Stock Theft Unit came to help. They traced the cattle, and found the culprits but the police didn’t arrest them. This farmer says the Stock Theft Unit is “a joke”. It has been reduced from 30 to ten people while the area of jurisdiction has doubled in size over the last 15 years. “They don’t even have vehicles”, said the abject farmer. He doesn’t blame everyone within the SAPS – many are desperately trying to do their job under impossible circumstances. A serious scandal of lost farmland and waste of taxpayer’s money greeted us in the Gwebo area. Three farms totalling around 4 000 ha - Kromellenbog, Eerstepunt and In Memoriam - were handed over to none other than Johannes Mdlalose. We were told that Eerstepunt had been one of the finest farms in the district – “it had the best cover of grass I’ve seen in a long while” said a local farmer. The owner really looked after the farm, he said – the camps and feeding troughs were in tip top condition for the more than 200 beef cattle which thrived on the farm. After the handover, agriculturalists were called in to give advice, and foremen were appointed so that the new owners had all the help they needed. Consultants drew up a business plan which was extremely comprehensive. It showed prospective occupants how to run the farm, explained the use of the tools and the farming equipment – the tractors and the ploughs – which were included in the deal. There was a big “handover” party for more than 300 people who ate and drank at taxpayers’ expense. It later transpired that the local indunas (local chief) threw out the qualified people, and ignored the business plan. Fearful of any threat to their authority, their actions resulted in the three farms “falling back into the stone age”, according to one observer. We traveled through these lands. Grazing grass was high – this was during the height of the 2003 drought – because there were no beasts – certainly not in the numbers which would constitute a profitable beef operation. The farmhouse had been occupied by the Zulu VIP’s, and squatter huts had been constructed. It looked like a picture from some old South African historical picture of Zululand. The occupants stripped the farm fences and used this to fence their own squatter houses. There is no water-born sewage. There appeared to be abundant water. As we approached one group of buildings, shots rang out in our direction and we quickly turned tail. There are plenty of guns in the beloved country. “Babanango is one of the best cattle areas in South Africa” said our farmer driver “Now look at it!” He continued, his face etched with stress: “I have to count my cattle every day”. We saw two farms which had turned into squatter camps – the farm Lisbon which used to be a successful dairy and grain farm of 2 000 ha and which was given to the Khambi Tribal Authority, and the once-productive dairy farm Wanbestuur, around 200 ha, now belonging to LandbouKrediet. Jabulani Mdlalose has already sold a good portion of this farm, which he doesn’t own, to squatters. The crime emanating from these farms is endemic, said our farmer driver. He said that LandbouKrediet has yet to lay a charge with the police about the squatters on this farm. The farm Mooifontein was in even worse condition that the previous two. The fencing had completely vanished. The house was vandalized and what could be taken away was removed. The owner did not live on the farm, but the manager moved off because of the intimidation. Here again, Jabulani sold plots for R1 500 each. The outbuildings had been stripped. This farm under normal circumstances – that is in a normal law-and-order society - would fetch R2 000 per hectare. Today it is worthless. Farmer Jan Hattingh (not his real name) told us he practically gave away his top farm for R1 000 a hectare to a black farmer who obtained a loan from the Land Bank. The farmer farms a few of his private cattle and uses the farm as a taxi repair operation. He said no white farmer would buy his farm because they simply cannot produce. We asked a land claims expert in the area what was the basis of the land claims on these farms. His reply was that the Mdlalose community were “landless”. We didn’t have time to count how many farms the Mdlalose clan had already been given in the area, but they have claimed – and received - at least ten farms that we know of. We drove back to Vryheid with heavy hearts. What can farmers do, we were told. With government allegedly supporting NGO’s who instigate and support land claims (even if the claims are not valid, which happens in many cases! ), and with the police literally turning a blind eye, there is no other way than for a farmer to pack his bags and leave the heartache, the fear and the stress. One reads of successful and happy farmers in South Africa’s agricultural magazines. These are the ones who do not live near squatter camps and traditional areas. But as farmers near these areas leave, the cancer invades further into commercial farmland. Will anyone eventually be safe? As we neared the town, a squatter camp on a hill came into view. On the other side of this camp, 500 m away, lay the Klipfontein Dam which supplies the town with its drinking water. So where is the sewage arrangement for these people, we asked. There’s nothing at all. When it rains the sewage runs down into the dam. The squatter camp land belongs to the State, we were informed by the Department of Water Affairs. And once again, the Mdlalose’s are involved. We were told that Johannes is the “agent” and is selling plots in the squatter camp. Agent for whom we could not ascertain. The Department of Water Affairs says they have received no complaints about the dam, so they cannot investigate the claim about run-off sewage. So where does the sewage go to, we asked? Upon enquiries to the local municipality, we were informed they were “aware of the problem”. This leads us to water, and the “projects” which are being lavishly funded throughout the country. An interested party told us of the Hluhluwe Water project where a purification plant costing R11 million was installed at the Hluhluwe Dam. The water is supplied to a nearby community. Consultants were brought in to monitor the project. After December 2002, the contracts ended and the community was supposed to run the project themselves. By March 2003, there was no water in the system. The water was cut off because the community didn’t pay. They paid when the consultants were running the project but as soon as they left, there was no payment. In April 2003 the consultants were appointed again to come and sort out the mess. The contract expired in December 2003 . . .
Said one farmer: “They all want this and that but they cannot manage anything.” Another R40 million is allegedly being pumped into this project, but it still won’t work unless the consultants are there. (We discovered the same problems in the Eastern Cape. Doubtless these situations are endemic throughout the country). This story ends with the report of a bizarre happening – trench warfare in KwaZulu/Natal. Farmers have built trenches 2m wide and 2m deep for more than 200 km in the Winterton/Estcourt area to stop cattle theft. It is working, they say, because the thieves can only slaughter at most one or two beasts and throw the meat over the trench. Do people in the city who enjoy the best steaks in the world realize what farmers endure to put those steaks on South African plates?